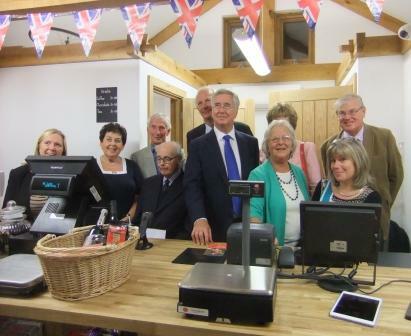 Ide Hill Post Office, which had been temporarily closed for more than two years, had an official opening ceremony on Friday 27 September, at its new location – the newly-built Ide Hill Community Shop, next to the Village Hall. Michael cut the ribbon to open the new Community Shop and Post Office at 8pm. 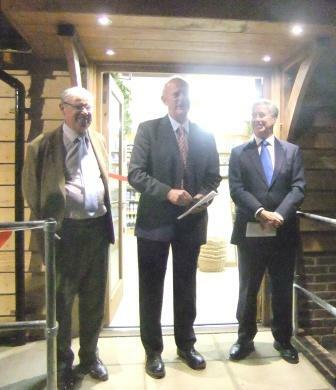 This was followed by a big village celebration, hosted by The Chairman of the Ide Hill Community Shop Community Interest Company, Andy Edmonds, and the new Subpostmaster Richard French, to thank everyone who had helped with the shop and Post Office project. Ide Hill Post Office was forced to close temporarily in July 2011 due to the withdrawal of the old premises for Post Office use. From 28 September it is operating from the new Ide Hill Community Shop. Until recently the shop had been run from a shipping container organised by the Ide Hill Community Shop Community Interest Company. The group then rallied villagers and local businesses to raise funds for more suitable premises, which could also accommodate a Post Office. Mr Fallon said: “Post Offices are vital to the local community and I am so pleased that Ide Hill once again has a Post Office. I am delighted to be re-opening this branch at a wonderful new location. The new Village Shop has been funded by villagers and businesses; this shows just what is possible when a community puts its mind to a project. Everyone involved should be congratulated. The branch is now one of the Post Office’s modern new-style open-plan “local” branches. Post Office Local is a new concept for delivering Post Office services from an open plan counter with Post Office products and services available alongside retail transactions during shop opening hours, allowing Post Office services to be available for longer offering greater convenience to customers. The new opening hours are Monday to Friday: 08:30 – 16.30; Saturday: 08.30 – 14.30; Sunday: 08.30 – 12.30. Subpostmaster Richard French said: “This is a very proud day for myself and the residents of Ide Hill, who have worked extremely hard to fundraise to make a dream of a village shop and a Post Office in a wonderful new building become a reality. This fabulous shop and Post Office will mean that residents will have essential services right on their doorstep. 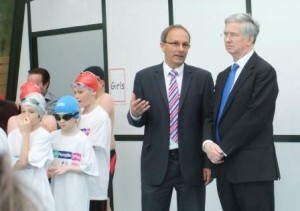 Michael opened the newly refurbished swimming pool at Amherst School today. Funds had been raised by parents, staff and Sport England. 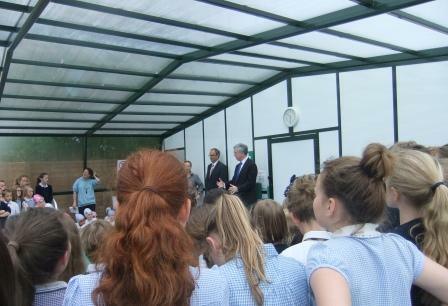 The Headmaster, Mr Derry Wiltshire officially thanked School Secretary, Mrs Jane Parish, who had worked extremely hard to co-ordinate the whole team effort and secure the funding for an all-year activity for the whole school. Congratulations go to all involved.